Goa is a major tourist destination in India. Every year millions of tourists come down to the state. They eat, drink and party. All this generates waste. A substantial amount of waste. How does Goa manage its waste? In January, I went to Goa with this question. I met Clinton Vaz, who is the founder of Vrecycle. A long-time resident of South Goa. He worked in Panjim Municipal Council, later worked as a consultant for residents to set up waste management facilities within their compound. Over the years, he realised consultation -advice won’t work. He must get his hands dirty. With that began Vrecycle’s waste management services. 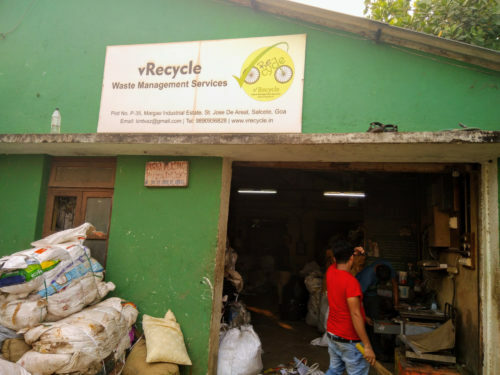 Vrecycle provides waste collection services to more than 10,000 and other units scattered across many village Panchayats and Municipal Councils in Goa. They support residents to manage organic waste on-site and collect dry waste segregated in as many as four or more categories- glass, paper, PET bottles and metals. Sanitary waste is collected separately. Organic waste is managed on-site. For bulk generators, an additional service of supervising composting services is provided. Whenever required a supervisor visits the site to see whether the process of composting is in order. Once week, they pick up the dry waste. For this village Panchayats and other bulk generators, pay the user fees. For larger units or bulk generators, separate bins for dry waste are kept within the compound. The glass goes in glass bin, paper in bins for paper and plastic in bins for plastic. Once these bins are full, the residents give a call and a truck is sent for the collection of segregated dry waste. The segregation of dry waste within compounds save cost on the first level of sorting of dry waste. After collection, the segregated dry waste is brought to the aggregation and sorting unit, if it needs to be sorted further, the sorters (erstwhile waste-pickers) undertake that process. Otherwise, it is packed and aggregated before being sent to recycling units. Glass goes back to soft-drink and alcohol manufacturers via partners of Vrecycle, Plastic and paper is sent to recycling companies. Multi-layered plastic, for now, is sent to cement kilns, though not the best option, but with current options available it is what one has. Glass along with other dry waste (recyclables, low and no value waste) is collected by Vrecycle from households and other units. Glass items majorly include alcohol and soft drink bottles both broken and unbroken. Broken and unbroken glass is sold to a neighbourhood unit (few metres away from Vrecycle- in Madgaon Industrial Area). From that unit, the broken glass is sent to Gujarat, where it is used for manufacturing of the glass again. Unbroken glass bottles are washed and sold to alcohol companies to use again. Old monk alcohol factory is next to this unit, it directly goes from the unit to the factory, where the glass is washed again, and alcohol is filled. Thus, forming circular economy in glass. Next time, when you drink and dispose of bottles responsibly, you know where it goes. Sanitary waste including diapers and used sanitary pads have not found any major solution. It is being stocked. Clinton claims that he has the largest collection of used diapers, stored in a godown. One doesn’t know what to do with it. Technically, diapers and sanitary pads are a sanitary waste. They are to be collected separately. After collection sanitary waste should be dealt as bio-medical waste. The facilities are far and few and expensive. It makes it nearly impossible for private waste management service providers to process on their own. He has been wondering that he is not a very big player in waste management services. Still, he is holding the largest stock of used diapers. His question is what do the other service providers in Goa do, especially the contractors providing services in jurisdiction of municipal areas. As mentioned above the facilities are far and few and expensive. One can assume it is being dumped somewhere. In case of Vrecycle, sanitary and some amount of ceramic waste is being stocked in the warehouse, till a responsible disposal system is figured out. Vrecycle is a small firm with twenty employees. Most of them were waste-pickers, few of them worked in dumping sites. All the employees get a monthly salary above the minimum wage in Goa, starting at INR 8000 and going up to INR 20,000. It’s companies like Vrecycle which are making Goa, probably, the only state where Gram Panchayats are actively managing the waste. In most other states, waste-management is considered as an ‘urban’ issue. There are some initiatives which have started in Karnataka. They are yet to reach the scale of Goa.